Thank you for your reply to my letter expressing my concerns about President Trump’s nomination of Mrs. DeVos. In your reply you mentioned it was your job to “thoroughly review the record and qualifications of each nominee.” I would imagine that didn’t take long since her experience and qualifications are next to none when it comes to public education. I would guess it took you less time to read the one sentence I sent you about my 16 years in education both in the classroom and at various levels of leadership than it did to vet her entire career. I couldn’t help but notice though that you didn’t specify or list any of Mrs. DeVos’s experiences or qualifications in public schools in your reply. Thank you, sir, for saving 1000s of public educators from ourselves. We listened to her testimony and heard her lack of experience, we read about the public funds siphoned away from Michigan’s public education system, and we saw the profits pocketed at the expense of our passion and our youth. However, you alone stood up to tell us that despite all the horrors we see in her nomination, that a party vote in DC was more important than the feedback and support of those that you represent. I recently saw a room full of fellow educational leaders ask you to simply vote NO. I watched as friends from across the state urged people to call, write, and email with our sincere concerns. I myself wrote you asking for a NO vote. The only reply we all received was a form letter telling us that despite all our feedback you were still going to send a party vote of YES. I was born and raised in Alaska and could not be prouder of Senator Murkowski who in reply to the feedback from 1000s of her constituents – who also value their public, rural schools – said she would listen to them and vote NO. It took true guts for her to listen to the public and stand against her party, but she is doing it to represent her state. The next time I am asked to support your run to represent us I will remember your choice for me and my family here in North Dakota. 15 Comments on "Letter: By Supporting DeVos, Hoeven Puts Party Over People"
Thanks for posting this nicely stated. Hoeven ignores ND educators therefore he doesn’t work for the people of ND. I am sure he is sending his grandkids to private school so he doesn’t really care about anyone else. Perhaps Hoeven and his staff should be field audited by the IRS… I would like to see if any money from DeVos went directly into his back pocket. John Hoeven is a coward and everyone should realize that now. 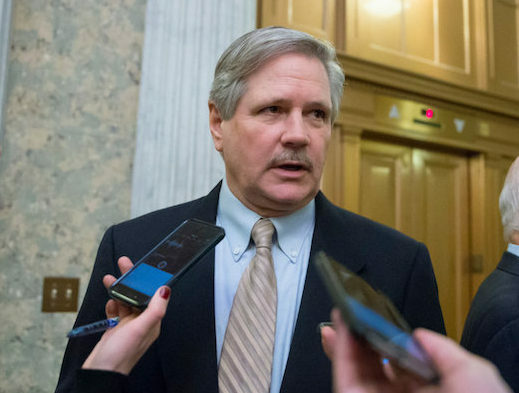 John Hoeven is one of the most principles and honorable people I have ever met… I first met him over 40 years ago… and can tell you that I have never heard of him doing anything except putting the people of ND first! No matter what office he held. I’ll take his judgement over some partisan “hacks” any day! You are a fraud much like your dirty money grabber John Hoeven. You are the partisan hack much like your “pal” and fraud John Hoeven. Now buzz off Patrick Ruelle you hack. Your constituents in North Dakota put our faith in you to take care of us. We understand that you are voting for Ms. DeVos, a person who has never set foot in a public school classroom as a teacher, has never attended public school, has never sent her children to public school, and quite frankly, appears to have a deep-set disdain for the public school system. We are very disappointed in your choice to push forward such a person into the position of Secretary of Education. We feel that you are not listening to our voices, to our concerns, to our feelings, and frankly, you are not listening to our children. We are the parents who have the gumption and strength to oppose unfair legislation. We are the people who are strong enough to fight for our children to have their fair share of this world. We are just the few that dare to speak out for our children. Many others are either too quiet, too shy, or frankly, too afraid to speak up – because who are they, if they are only parents. We know our children better than anyone. We are raising our children, we know what our children need to succeed. Our children need well-paid, educated teachers and administrators. Our children need easy access to accommodations. Our children need to feel safe (guns inside schools does not make them feel safe). Our children need to feel that they are being heard and that their voices count. Our children need to be seen. Our children need to know their worth. Our children need someone better than Betsy DeVos. Our children need someone better than a person who holds disdain for the very profession she is going to be managing. We North Dakotans deserve better. We North Dakotans deserve to be heard. We North Dakotans deserve to be seen. We North Dakotans deserve to have qualified leaders in Washington. When will our government officials (that’s you) speak for us? We are beginning to feel that this administration only speaks for money. Vote NO on Betsy DeVos. Be daring. Be brave. Be North Dakotan. How can you in good faith support this woman for Education Secretary. She doesn’t understand anything about what her job would entail. Please vote against her nomination. I have my doubts that DeVos can even spell education. Apparently that’s still good enough for John Hoeven. So many times I have watched you and listened as you spoke so highly of North Dakota and what WE stand for and how you are going to be our voice in the Senate…well now is your chance! North Dakota believes in the treasured value of public education and this nomination for Education Secretary doesn’t have a clue what that means. I was a rural school Business Manager in ND and I have more experience than she does. If you’ve never been a teacher, student, board member, cook, paraprofessional, bus driver, principal, janitor, mechanic or a parent of a student at a public school, you have no understanding or knowledge of how they run. Please reconsider your vote today. A NO vote is what ND wants and needs. There are others out there that are more qualified for this job. Don’t just vote your party because you’re afraid Mr. Trump “will be mad at you”. Do the right thing and vote NO!! So many children, educators and parents are counting on you to do the right thing for them. Stand up and be OUR voice!!! A perfect example of what I have been saying all along, you people cannot stand alone in your decisions on anything, it’s always the PARTY vote. When will you and your pals in Washington get some %&^#s and work together to show America that you can accomplished just one thing. This was a Bad Choice and you in your own mind have to realize it, who in their right mind would hire someone with NO experience, maybe this is what we need to do in the next go around for you!!! Congrats you lemming. Do you want a cookie now? I emailed the Senator this morning and asked for a public release on communications from constituents regarding DeVos, total number with breakout on pro vs. anti. If significant majority were against the confirmation would indicate Hoeven is choosing party loyalty over ND voters. Maybe someone from media could ask this question. In his inaugural address Mr. Trump said “an education system, flush with cash, but which leaves our young and beautiful students deprived of all knowledge” He places little or no value in our public schools. His choice of DeVos for Secretary of Education should not surprise anyone. DeVos wants vouchers, support for private schools and charter schools, and is unaware of the basic standards of education. I taught in Fargo for over 30 years and have seen many changes in education. I wrote Senator Hoeven asking him to vote no on DeVos. I grew up in a small town and I can see no benefit for rural areas with DeVos as Secretary of Education. I think Senator Hoeven is an honorable man, but in this instance he voted against North Dakota’s interests.